Subtlety – today we think of the word as the quality or state of being subtle. Our Medieval ancestors knew a subtlety as a cooked dish that looked like one thing but was something else. There are many little “touches” that you can use to make a period feast prettier and more authentic-looking. In a previous article I discussed making sugar plate and candied violets and then using them to create an enjoyable and unique, by modern standards, subtlety. Another project comes immediately to mind – something simple with an easy culinary joke. 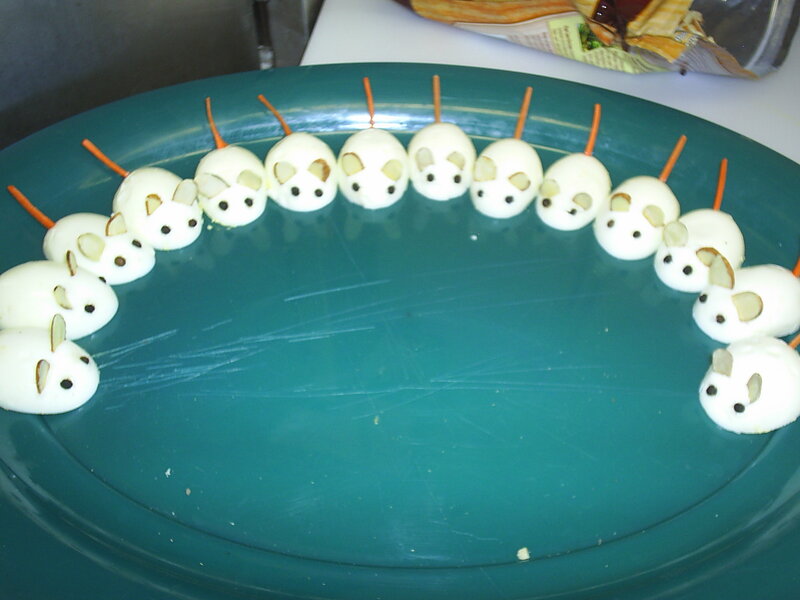 “White mice” is a simple Roman recipe – an easy and inexpensive way to serve eggs. When we served this dish people were already getting the idea that some of the things we were doing were jokes, or a play on words. 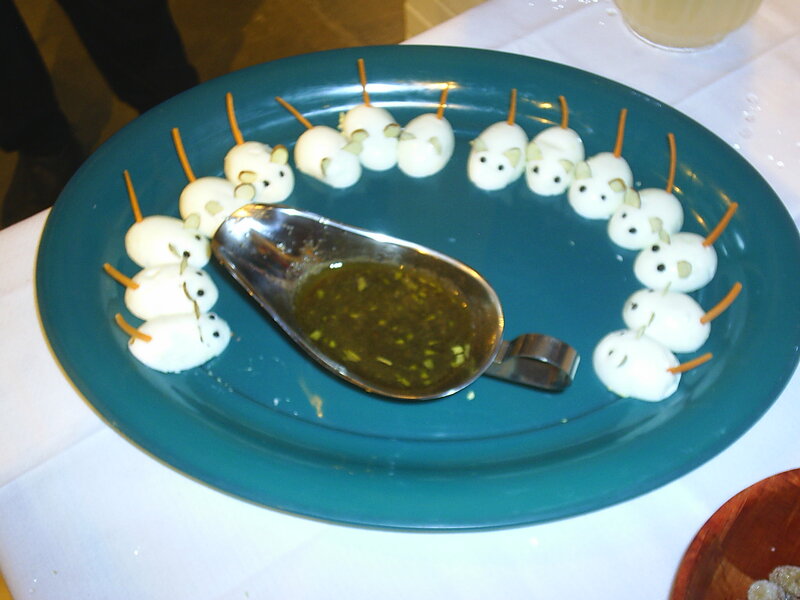 The first tray of “mice” was announced and placed on the dayboard (snack) table. People thought they were cute and they were eaten fairly quickly. A couple of our volunteer kitchen staff took pictures. This picture shows a tray of mice with carrots for tails. The sauce boat has not yet been placed on the dish. The next tray was announced as having something special about it. People came to see it and many pictures and much laughter ensued. Can you see what is special? The answer: Three Blind Mice! It was really interesting to see how many people really enjoyed the joke. That sort of jest would have been a common part of a medieval feast. Grind pepper, caraway, cumin and bay leaf together in a mortar. Add green herbs tied in a muslin bag, finely chopped dates, vinegar, wine, stock and olive oil. Bring to a boil then simmer gently for 20 minutes to reduce. Remove herb bag. Cut eggs lengthways and place side by side on a serving platter. Place the sliced almonds as ears, cloves or peppercorns as eyes and use the chives as tails. Pour sauce over the mice and serve. WARNING: Don’t eat these eyes! We chose to put the sauce on the side and allow people to serve themselves. We suggest labels to let folks know what is in a dish. Some of the flavors can be a bit startling to the modern palate. Another approach to décor for a Medieval feast is embellishment with pastry. There are many Medieval cooking manuals and descriptions of feasts which detail the elaborate constructs of pastry that were often presented at feasts – Gilded and painted presentations of the bakers’ art. 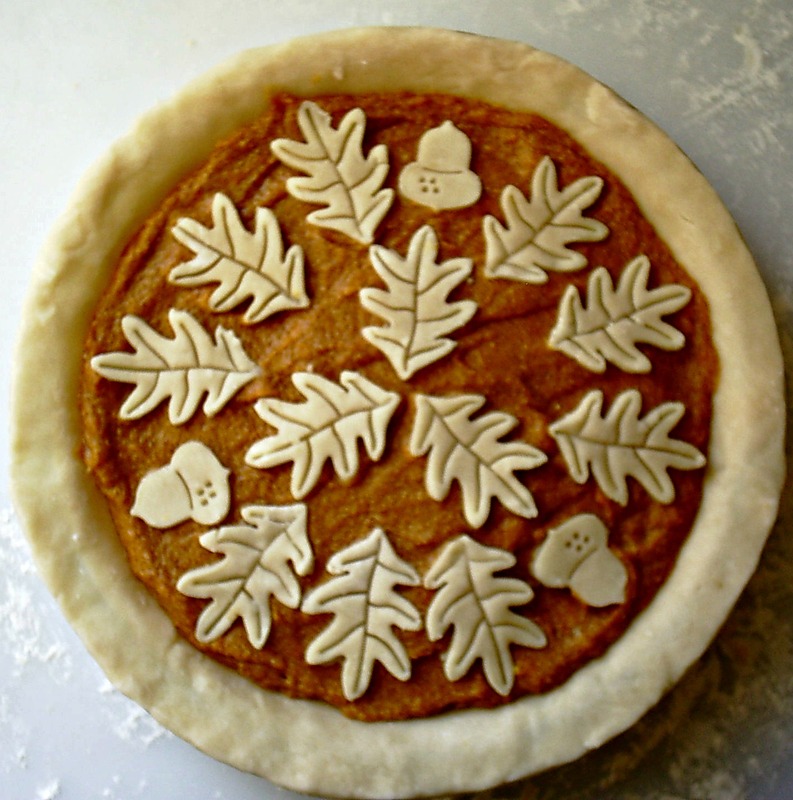 A simple, but effective approach to this is to simply use the crust from a pie or tart and make it more decorative through the use of cookie cutters. I am fortunate enough to own cutters designed for pastry dough, but any simple shaped cookie cutters can be used. Simply place the cutouts using your fingers and a knife to fine tune the positioning. 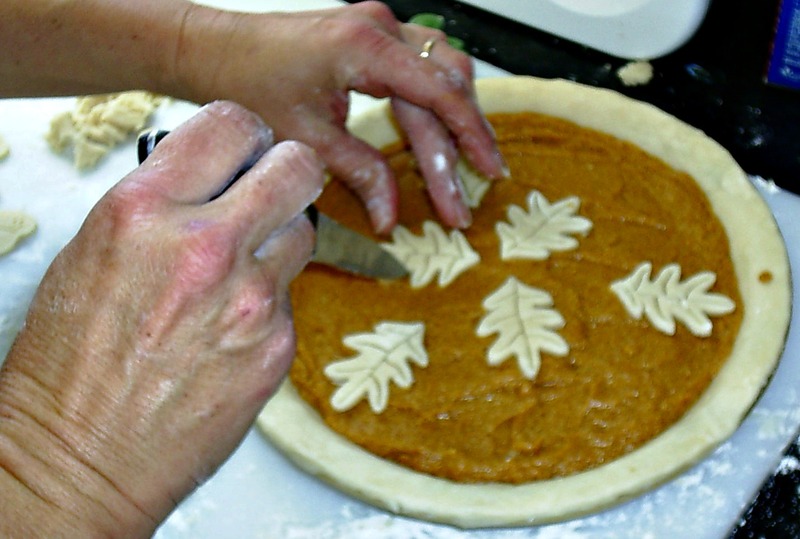 Pastry in place before baking. This is the version for the Head Table. The other tables received a simpler version with fewer cut-outs. The cut-outs were designed so that every slice received a decorative piece of pastry dough. This use of extra pastry has now become a tradition in our home. 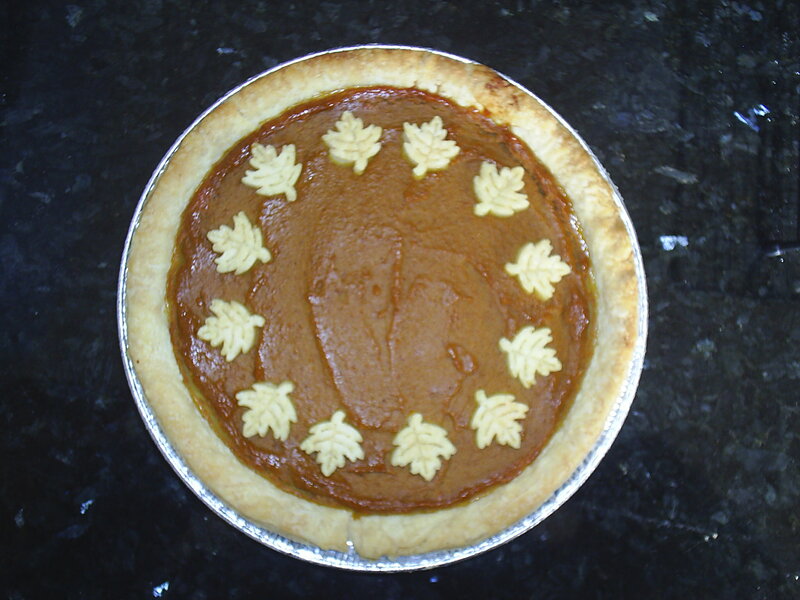 All of the pumpkin pies at Thanksgiving and Christmas are decorated with leaves and acorns. I hope that this gives you some ideas about how a simple culinary joke or bit of pastry can improve the mood and feel of a feast.